Drug addiction counseling; opiate addiction counseling; counselors for opiate addiction, no matter what you are looking for with reference to getting some help to eventually give up on your drug addiction; we, at Recovery Concepts in the Greenville area have licensed professional counselors for opiate addiction treatment. In addition, patients have access to nurses; pharmacists & physicians for their care here at our facility. You can avail treatment as an outpatient. Addiction to drugs is definitely a complex illness that needs lot of help. It comes with health consequences. The social consequences are alarmingly bad, not to miss the legal implications. There are different types of treatment problems. 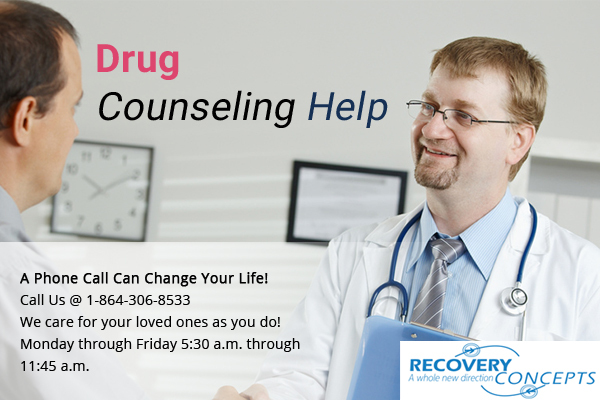 There are several types of treatment approaches available when it comes to helping someone recover from drugs addiction. And, no therapy is complete without counseling. Drug education is a part of the drug education program we offer in our facility. We offer formal treatment programs that are customized in a way to suit the individual needs of patients. Relapse is a serious disorder in most of the drug addiction rehab programs. Patients who are strong willed about improving tend to slip the slope and fall back to where it was worse all over. When it comes to getting some help with chronic relapses counseling does play a very important role. It can feel like the idea of getting someone who is addicted to drugs as a hopeless waste of resource. Well, the answer is yes in some cases, and no in most cases. With repeated attempts and counseling, it is possible to get one back to straight life over again. It is only few cases that go to the hopeless corners. Those who are left uncared for, never find the road to living well ever after; however, those who decide they need help tend to get back to normal in the immediate near now or in the late future. It is about how much of efforts are put in to helping someone out of the addiction that makes the difference. Medical management of drug withdrawal plays an important role in most detoxification programs. Professional grade counseling can help these patients with personality restructuring and socialization lessons to get back to normal life after addiction rehab program, which is very important to be able to help the patient feel normal about self after a bad session in life. If you have a good family and peer environment the de-addiction process can be greatly accelerated. If you do not have a supporting environment, there is lot of help available from our counselors who will help you with the details of how to move ahead with sobriety by improving on your will power to deal with hard times. Just walk in and ask for help. We are here to assist you. Methadone programs are very common methods employed in helping with withdrawal symptoms that are related to opioids. The duration of treatment is short term in an outpatient setting. So, if you or anyone you love are actually those who need help, you need not worry about an inpatient program that can get too expensive. Drug addiction rehab program is available at an affordable cost. All you need to be doing is to make it to the appointment and follow up with your counselors at Recovery Concepts De-addiction facility in the Greenville area.